That sounds like a very fun campaign. Also, if you’re trying to run a 4E game in an Old School style, make sure you check out Sully’s blog at . And it doesn’t seem to like me including a web site in my comments. Let’s try packofgnolls (dot) blogspot (dot) com. Cool idea. Sort of a DnD murder mystery, except the conclusion remains a mystery to all due to the rotating DMs–nice! Blackwater Falls sounds like an insanely fun campaign. I’m going to file that idea away in my drawer of future campaigns. I see you’ve written a couple other posts about that campaign. I look forward to checking them out! Unfortunately, the other two Blackwater Falls posts don’t contain much information. Sorry about that! Though you get to see some of my old artwork in the Harlan Katz post. This was definitely one of the most satisfying campaigns I have played in. It’s really interesting, in hindsight. We stumbled into many of the tropes of old school play without having any knowledge about them or mentors to teach us. The tentpole megadungeon, the slow crawl of wilderness exploration revealing the map, and many other things. 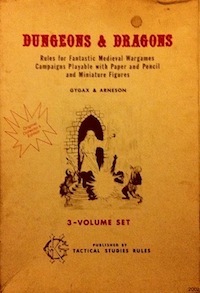 Comparing that experience to what I was reading on the web in 2011 was really one of the biggest things that got me interested in the OSR.